Hi friends and members of my Wellness Tribe! I wanted to take a few minutes and introduce myself and really let you know who I am, not just as a fitness professional but as a person! I am a wife and mother, of course, but with a military twist ;). I have been a stay at home/ work at home mom since my first daughter was born. I LOVE the freedom that comes with being able to set my own hours and be there for preschool dropoff and pickup and run all the errands and still have time to just be ME. We've moved a lot with the military, so I've had to learn to be adaptable and make friends quickly! I also love reading, writing and drinking coffee! I have a Bachelor's degree in Journalism/Mass Communication and still love to write, though I don't have enough opportunities for it in my everyday. I find ways of keeping connected with the things I enjoy, whether it's blogging (hello! ), volunteering to run publicity for the spouses' club or just reading on my Kindle while sipping a coconut milk latte. I have a fairly sunny disposition now, but I haven't always been so fortunate. Like many other women I have a past that's littered with anorexia, poor health, depression, anxiety and some plain old bad choices. I let it get to me for awhile; I thought there's no way I can run a health business, people will think I'm a sham! But let me tell you what shifted for me: I turned my mess into my message. I am now free to share my past, because I kept it just that, my past. 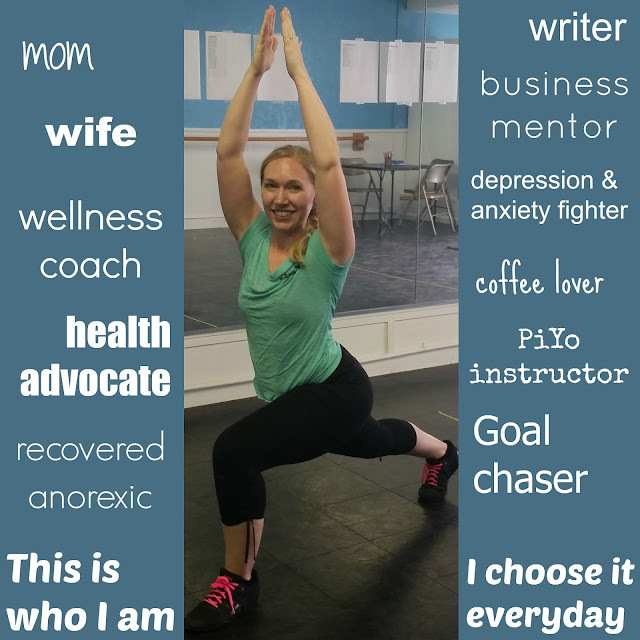 I learned the hard way, by hears of mistakes, how to free myself of that and use it to propel my love for health and eating to fuel my body and SHARE my story with others to show them that there's always an option to live toward the light. I am currently a wellness coach and mentor and a PiYo Live instructor, so fitness and health have become a big part of who I am. I work out almost daily (I take my rest days too!) and eat about 90% clean (I take my cheat meals too!) and have developed a love of modified Paleo (I eat very little carbs and dairy but still incorporate them in moderation to keep my body running properly). I set big goals, and chase them. I don't apologize for my intensity and I always make sure to take others with me on my journey. What good is success if you can't help others succeed too?? If you're on your own journey and want to chat about what's next, message me! Let's chat about it! I hope you feel like you've learned a little about who I am and can see that we'd work well together :). Please use this form to subscribe to my email list and find me on Facebook at fb.com/shannonambrosonCOACH. Thank you for spending some time with me! Follow Shannon Ambroson's board 21DayFix on Pinterest. Why should I become a Coach on your team? Shannon Ambroson. Powered by Blogger.